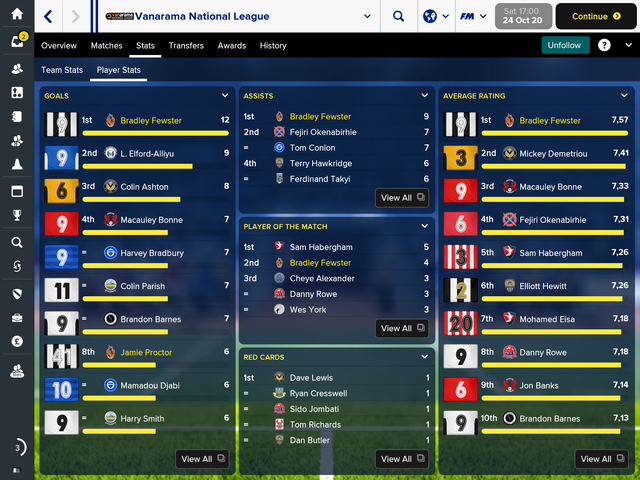 The draw for 3rd Round in FA Trophy seemed lucky for us as we should play away against King’s Lynn - an opponent we already had met in FA Cup this season with a goal galore win (7-2) as result. 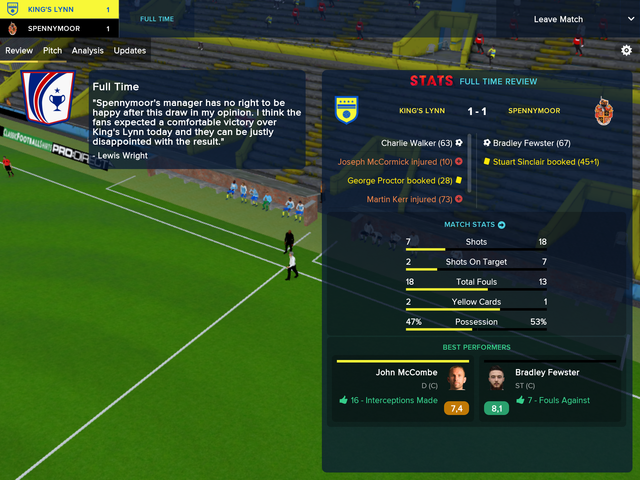 Perhaps the previous win made us complacent as we struggled a lot but came from King’s Lynn with a 1-1 draw as result after an important equalizer by Bradley Fewster. 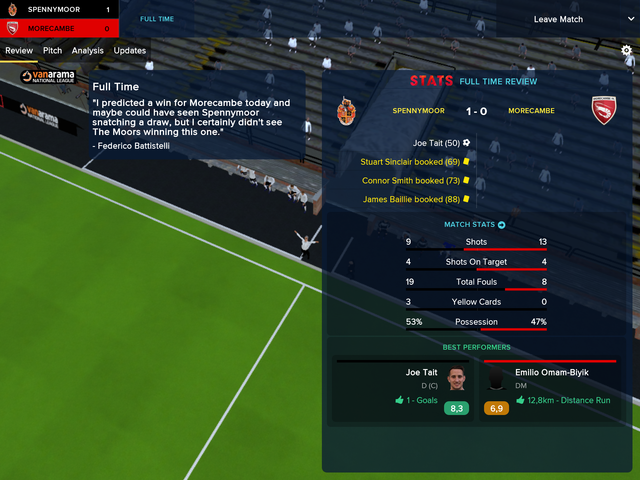 In National League we followed up with a fine 1-0 win at home against leading team Morecambe after a rare goal from captain Joe Tait who now primarily was a backup player in our defence. Our program was quite heavy in this period with many league and FA Cup matches. 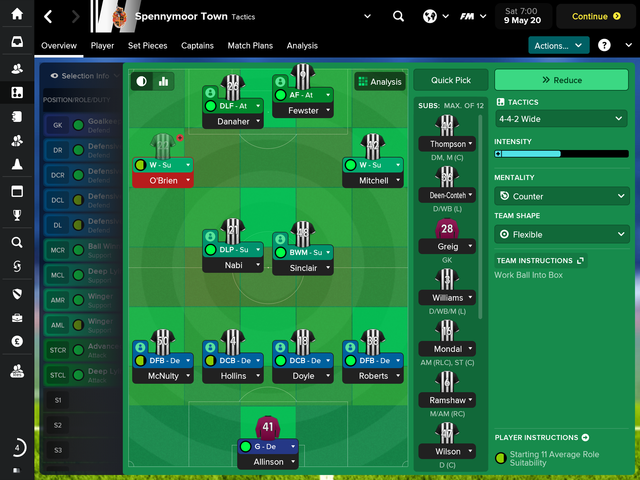 I tried to rotate our starting lineup as much as possible but the heavy match load could be seen in our results. 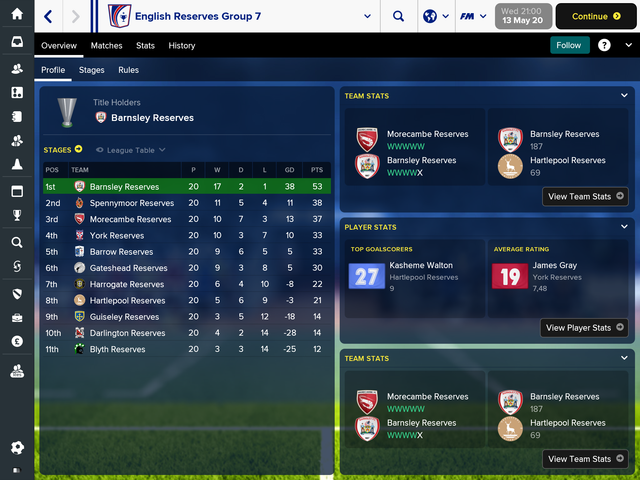 We lost the two next league matches (away to Gateshead and Dover) and lost our previous position in the league standings. Our quarterfinal in FA Trophy was to be played at home at Brewery Field against Dagenham & Redbridge, one of the other leading teams in National League. 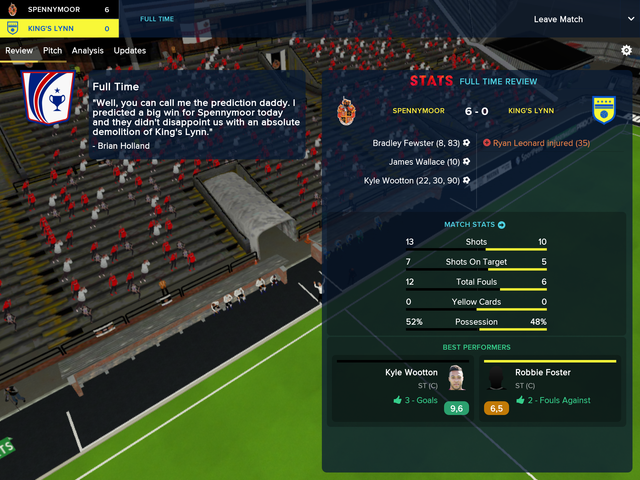 In front of only 750 fans (a bit disappointing) we were under pressure most of the match and were lucky to get a 0-0 result and a new match and hoped that we could play better in the replay. 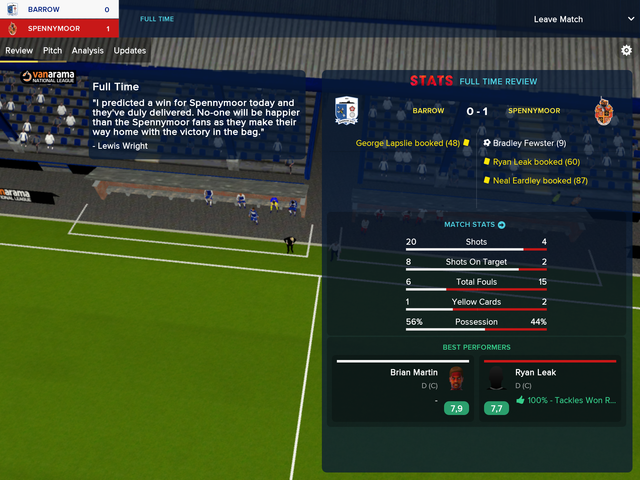 The FA Trophy replay match was our 9th cup match in the season and our 11th match in six weeks. Our players were very tried at the moment and we played bad in the coming league matches. 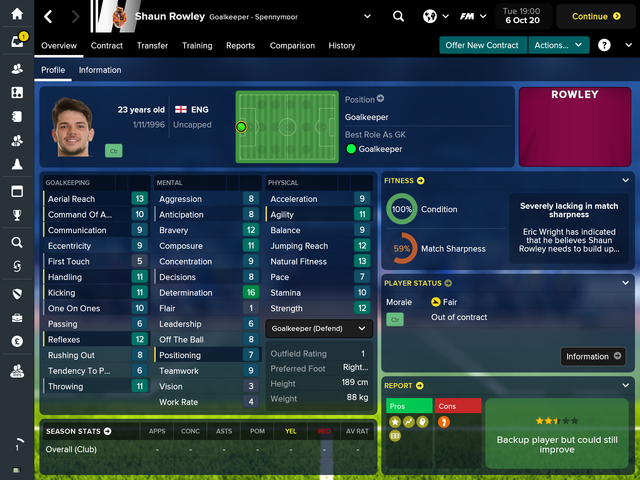 Bradley Fewster finished third in the goal scorer list topped the list of assists and was the player with best average rating all season! 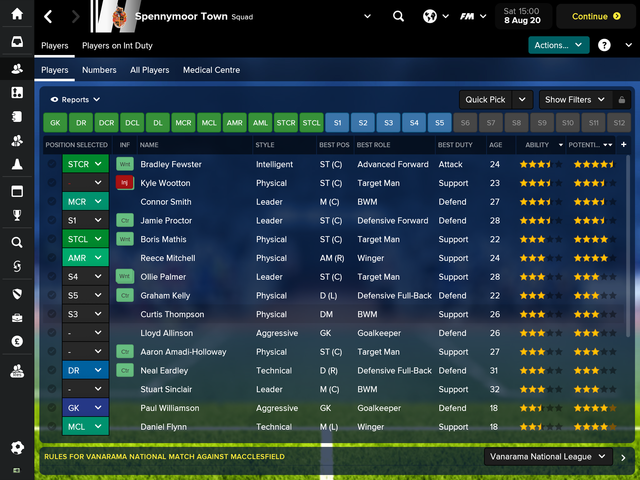 Like in previous seasons I had used many (too many) players in my first team (48) and perhaps we could have played better with fewer players but a lot of fine players had come to our club during the season and without the strong new players we probably could not have made the fine results that we did. The depth in the squad had become one of our strengths and our reserve team proved that by finishing 2nd in Reserve league which was our far best result so far. 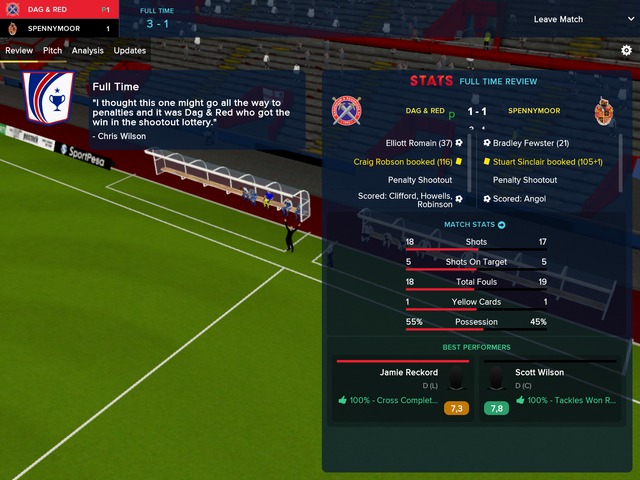 Once again, Bradley Fewster was awarded Player of the Year and Young Player of the Year by our fans after another stunning performance from his side. Lewis O’Brien became best New Player of the Year. 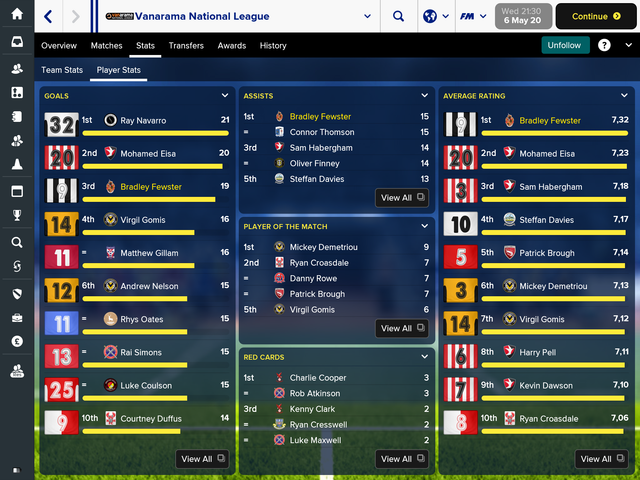 We did not achieve any league awards this season. 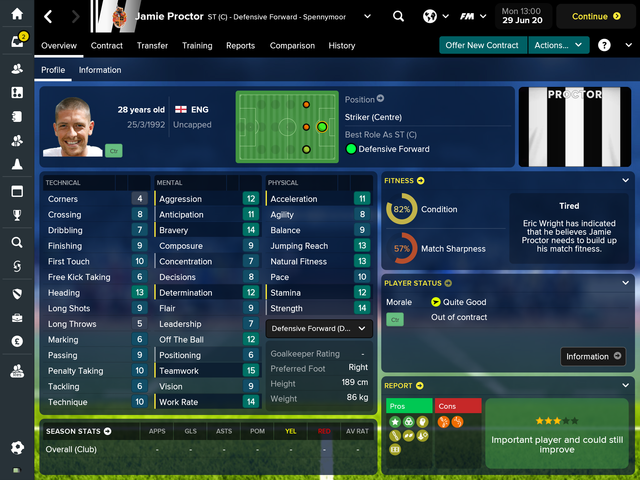 I was about to begin my 4th season with Spennymoor Town FC. So far the results had been a 3rd place in Vanarama North (lost playoff final), winning Vanarama North and latest a 7th place and participation in the playoffs in Vanarama National League. What was to be expected in my 4th season? The Board expected to continue the success from last season and reach Playoff again. The Board increased my wage budget with 10% to £14,750 per week. A small increase in my opinion but due to our insecure financial situation I had to accept the limitation of funds. The bookmakers expected us to finish 5th so it was similar to what our Board expected from us. Paul Williamson and Daniel Flynn could be some of our future stars and both were signed for two seasons at low costs. It would be interesting to see if they could make it to regular playing time already this season. Neal Eardley had come to Spennymoor to get regular playing time. He was a shining star in his younger days at Oldham and Blackpool, was capped for Wales at 18 years and played in Premier League for Blackpool. He suffered a knee injury in 2013 and his career had whithered since then only playing 44 league matches since 2013. He and Lyons-Foster were appreciated players at our right back position which had been one of our weakest positions last year. I was hoping his experience could be good for us. Jamie Proctor, Graham Kelly and Ryan Leak were also good players and would probably get some match time during season. The Board decided to make another partnership with local Durham which was a club at the same level as West Auckland. As regarding West Auckland it was hard for me to see what use we could get here but I sent some of our youth intake on loan there aswell. 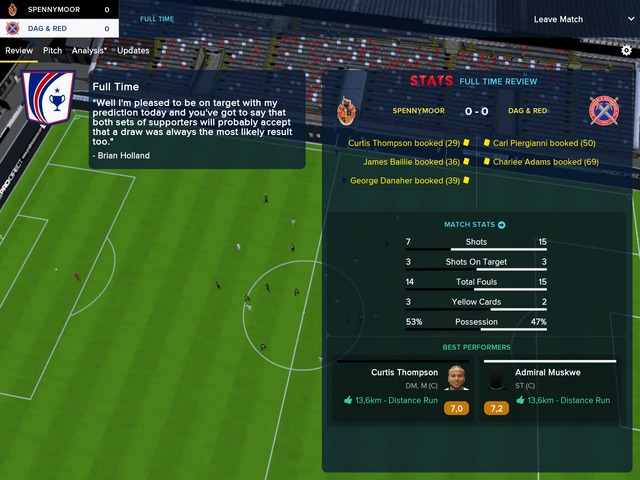 We played 8 friendlies in pre-season, 7 against local sides (7 wins and a total goal score of 29-4 and a respectable 1-0 defeat to Dunfermline from Scottish Championship. The season ticket sales soared from 266 to 297 season tickets - almost twice as many as we had three years ago so we were on the right track! 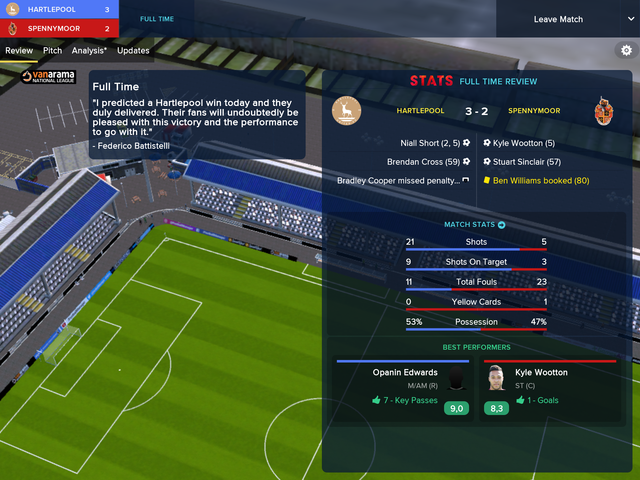 We performed very well in the beginning of the season. After nine rounds we were still undefeated after eight wins and a draw. 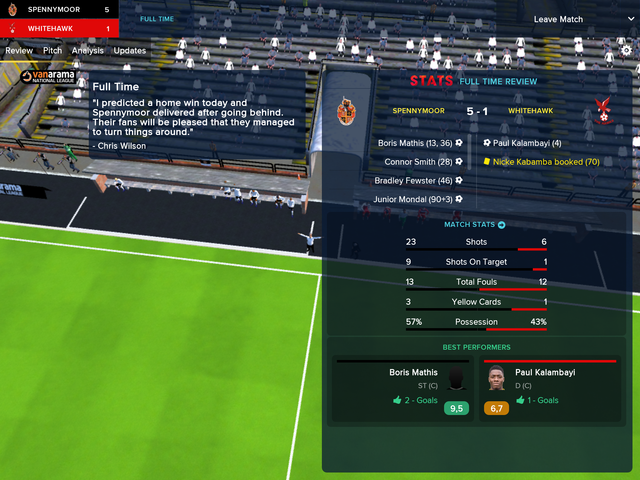 In some of the matches we were quite lucky, e.g. 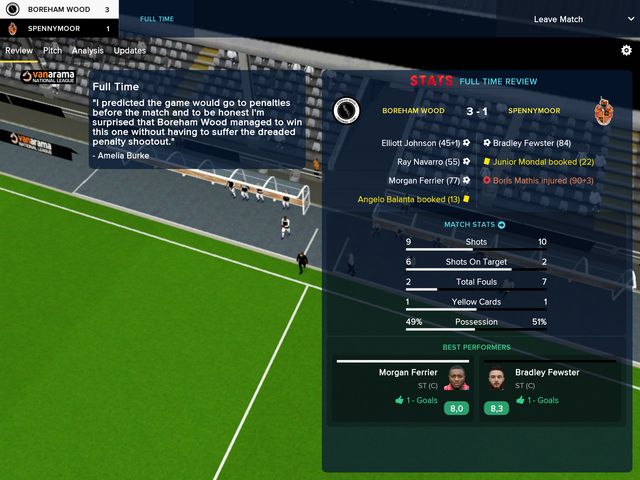 the match shown below before losing 0-1 to relegated Notts County. On 1st October the Board reacted on our financial situation when cutting 17% of our wage budget from £14,750 to £12,250 per week. 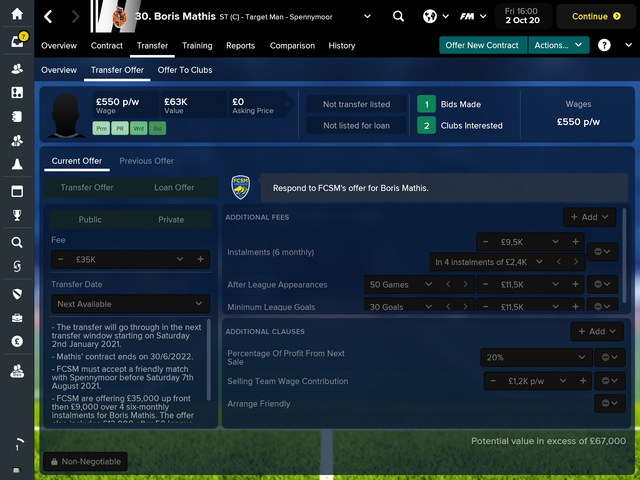 The news about our financial situation created unrest in our squad and as if anyone knew of our situation we received an offer from FC Sochaux the day after regarding or French striker Boris Mathis. Boris Mathis is a rotation player in our squad and the offer (£43,500 with £23,000 in potential bonuses) seemed as a good deal for us. A record transfer for the club and everything seemed fine. 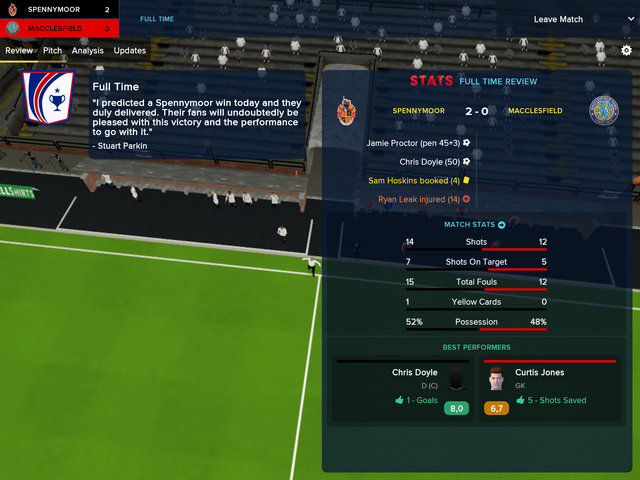 The unrest in the squad had immediate effect on our performances. 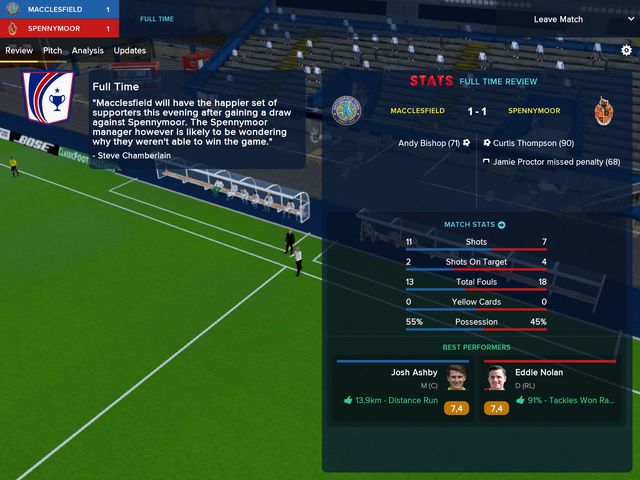 Only one point in the following three league matches and a disappointing draw away against Macclesfield (24th in bottom of National League) in FA Cup after a missed penalty by Jamie Proctor and a last-minute equalizer by Curtis Thompson. 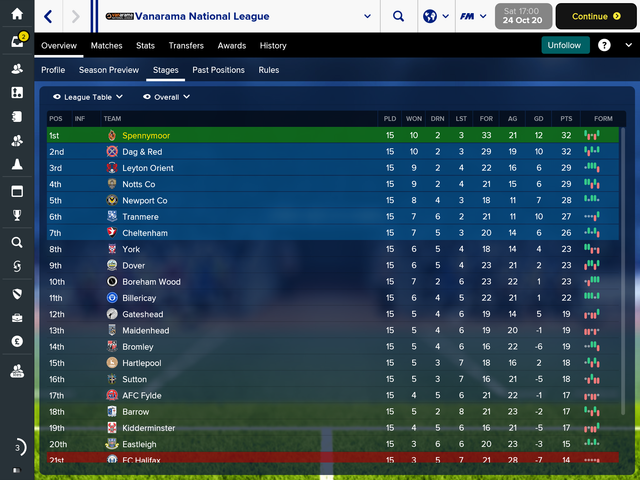 After 15 rounds Spennymoor Town was leading National League with 32 points just as Dag & Red in second place. It was still early in season but it seemed very possible to reach the playoffs as expected. And perhaps even better.... I believe it could become necessary to get promoted to save the club’s financial issues. We signed some very fine players all on non-contracts so they would not destabilize our financials further if not playing. I was especially pleased with the signing of Liam Wakefield a very competent player for our defence. Looks great man. Keep it up! 2018-09-12 03:33#250871 FoolishFooty : Looks great man. Keep it up! 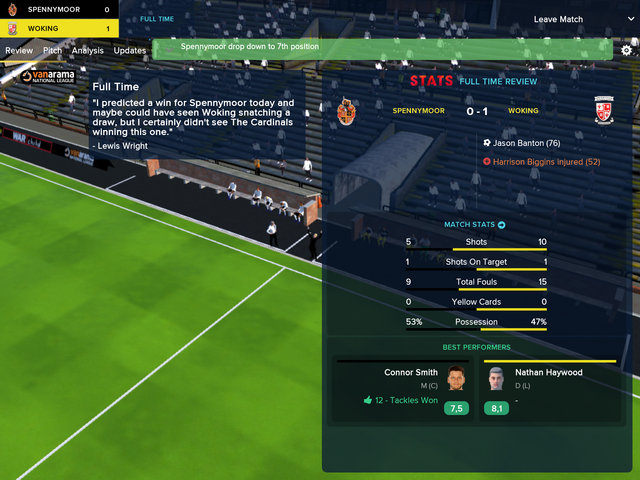 You are reading "Spennymoor - With hope, no one shall fail".